My attraction for watercolor is unquenchable! Ironic, huh? It challenges me, it inspires me, it sometimes frustrates me, but when it works, in my mind, there is nothing more beautiful. I thought I’d have a more detailed, larger landscape ready by this time, but I wound up going in a different direction (shocking, I know), so instead, here is another tiny painting inspired by this photo that I took the other day by the side of the road. I’d hoped to get some gesture drawings of a small bunch of cows who used to hang out here, but they were all gone. No moos in sight! Barn was still there though, and there was a lovely thistle just begging to be included in the composition. 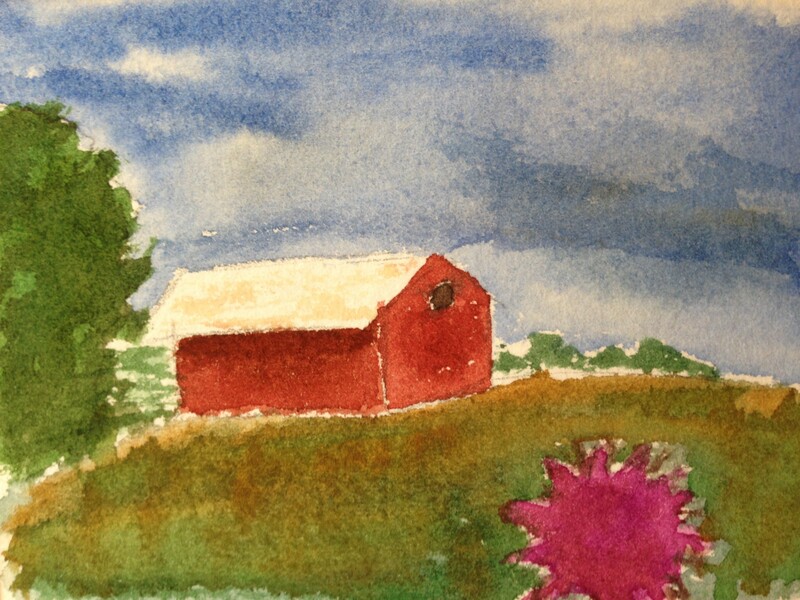 I knew I wanted the barn closer in the painting than in the photo, but I think this little (2″ x 3″) sketch may have it a bit too close. The thistle didn’t turn out quite as I’d wanted either, but that’s the nice thing about working small: you can test out composition and color, and then decide what might work in the finished painting. I think what I need is a larger, more detailed thistle to give the painting more depth. I think in my case, I may need more miles on the paintbrush to make this work in a larger painting, but I’ll give it another try, hopefully soonish. Have a happy Tuesday. Smile like a cow in a meadow! Chew thy cud like you mean it. 😉 Moos and peace. What a wonderful photo! The perspective really makes it special. I like your barn; bigger is fine, but I would try it again with more foreground because that is really what gives the feeling of distance. Of course you probably need larger paper for that…and then you can do a more detailed thistle too. Thanks! Yeah, good point. The paper size wasn’t helping me out much with this one. What a cool little painting! i love your painting and drawing spirit! Big Moos to you today to! Haha! thanks, Sharon! We shall moooo in unison! You think so, Kathy? Thank you. I can’t figure out complicated cameras at all and don’t have the will to try, honestly, so this was taken with my iPhone 5c. I appreciate your compliment! Probably your artist’s eye. You seem to have a knack for composition. And sheesh…if you know how to place things in the frame, the rest is easy! It’s easy if you’re you! I appreciate your words, because I am working on composition. I still feel like I have quite a ways to go, but when taking the picture, I was trying to compose it as I would a painting. Maybe that helped. I enjoy taking pictures but only with something that’s “point and shoot”. Ooh. That’s a wonderful photo you took! 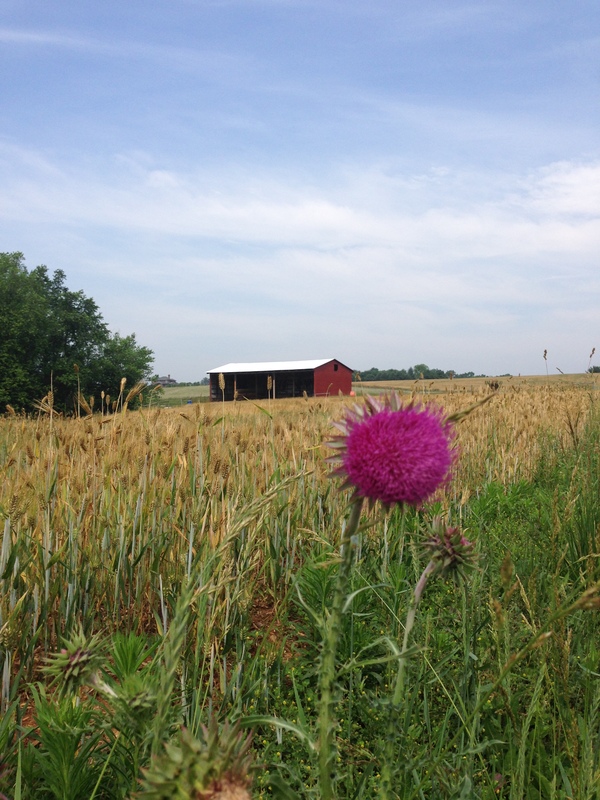 I like the vast distance it captures and how it has the flower up close and then the barn far away. Nice watercolor too. I agree with the consensus that a bigger canvas for more foregrounding and detail work might help. LOL! I will chew my cud with joy! Teresa, you happy cud-chewer, you! I’m glad you like the sky. Sometimes I luck out. Usually I try too hard which I’ve found is the sure way to kill any sky. :)) Glad you enjoyed this. I enjoy everything you do! What a beautiful photograph, it´s perfect!!! And I really like the picture you made of it. The bright roof gives it a lot of sunlight!